Cognitive impairment is a significant risk factor for post-operative delirium and other cognitive complications after surgery with general anesthesia, thereby creating a need for rapid reliable preoperative cognitive screening tools. One common tool is Clock Drawing Test (CDT). Scoring criteria for the CDT varies, however, and some research suggests certain scoring methods are more challenging to learn than others. 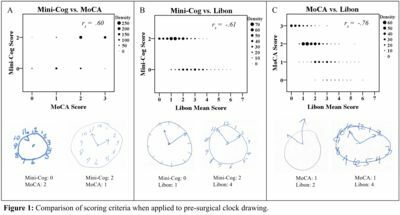 With the eventual goal of providing insight into which scoring systems to use in a preoperative setting, we assessed CDT score intra- and interrater reliability for three common methods: Libon, Montreal Cognitive Assessment (MoCA), the Mini-Cog, as well as agreement among criteria. This investigation is based off retrospective database review (IRB201501075). Step 1: Three novice medical student raters independently scored sets of 20 training clocks using Libon (error- based, 0-9, 9=worst), MoCA (accuracy-based, 0-3, 3=best), and Mini-Cog (0 or 2, 2=normal) scoring criteria. Clocks were de-identified and randomized per rater and were used to create multiple sets. Raters continued to score sets until they established intra- and interrater reliability (.70). Intra-class correlation coefficients were used to assess inter- and intrarater reliability. Step 2: The raters then independently scored 585 clocks from patients aged 65+ at UF Health's preoperative center using each criterion. Two-way Spearman's correlations were used to compare the agreement between scoring criteria. Step 1: Adequate intra- and interrater reliability was established after one set of 20 clocks using the Libon criteria, two sets for Mini-Cog, and three sets for MoCA scoring. Step 2: From the set of 585 preoperative clocks, all three scoring methods found a large number of potentially impaired patients (Table 1). All three scoring methods were generally in agreement (as shown by significant correlations, Figure 1). However, discrepancies between scores of individual clocks (e.g., a passing score with MoCA yet failing with Mini-Cog), did exist between criteria (Figure 1). Scoring approaches for the CDT differed in the time it took to achieve rater reliability. Though all methods detected impairment in preoperative older adults, there were also notable cases where criteria scores 'disagreed' on an individual's level of impairment. Practitioners implementing a criterion for impairment are encouraged to appreciate limitations of the scoring criteria when designing brief cognitive protocols within their preoperative clinic.